Port Phillip Bay fishers catch iconic Victorian fish species including King George whiting, calamari, garfish, snapper, flathead and sardines, loved by the Victorian public. Unfortunately, there have been a lot of recent changes to the Port Phillip Bay Fishery which has reduced Victorians access to local and sustainably caught fish. In 2016, 33 of 43 access licences were bought back by the Victorian State government as a result of their 2014 election decision to remove netting from the Bay. In 2022, only 8 licences will remain with the netting entitlements removed. Where is Port phillip bay? ​Like all Bay and Inlet fisheries, Port Phillip Bay fishers catch a mix of species to sell, which has provided a great diversity of species for consumers. However, with only ten fishing licences remaining, and as netting is phased out, the mix of fish available from Port Phillip Bay is changing. King George whiting has always been a key target species for Port Phillip Bay fishers, and the Bay has historically provided the highest volume of King George whiting from Victorian fisheries. Southern calamari, snapper, flathead, garfish, yellow-eye mullet, gummy shark, and flounder all made up significant proportion of the catch in 2014/15. Anchovies and Sardines make up over 50% of the total catch in Port Phillip Bay. In 2014/15, the fishery produced 820 tonnes of fish for Victorians, with 80% of the fish consumed locally. See the catch for each major species caught in Gippsland Lakes between 1978/79–2014/15 here. Figure identifies the changes in professional fishing catches across 4 key species and all licences operating in Port Phillip Bay from 2003/04 till 2016/17, including identifying the number of licences. What methods are used in port phillip bay? Port Phillip Bay fishers use highly sustainable methods to fish. One or two fishers man an open boat of approximately 8 metres in length, with some fishers working in a team of two boats, sharing the catch. The main methods of fishing currently are haul seine and mesh nets, with the nets hauled manually as has been done since the fishery began. Longlines are used to catch snapper in the season. A small purse seine is used to catch sardines and anchovy. Longlining is a static hook and line fishing method. It is used to catch snapper in the Bay. Longlines are a length of line with a number of baited hooks attached at intervals. A total of 200 hooks is the maximum for Port Phillip Bay licence holders. The line is set horizontally on the seabed and left to soak for an hour before being retrieved. The fish are Iki Jimi spiked and put in an ice slurry. There is no bycatch. ​​Purse seining requires hunting for schools of fish. In the case of Port Phillip Bay, this is for sardines, anchovy, and sprat. These schooling fish were historically found by looking for birds feeding. The fishers are now helped out with sonar and echo sounders technology. Once the school of fish are located, the boat pays out the net in a circle around the school at the surface. The bottom of the net is then pulled together, creating a purse, with the fish enclosed. With the purse alongside the boat in the water, the fish are then scooped out either by hand or with the use of a hydraulic boom, and emptied into fish bins. The fish are iced, and also salted if going to be used for bait. The fishery is highly sustainable with no bycatch. How is the Port phillip bay fishery managed? The number of Port Phillip Bay fishing licences in 2018 is 9 transferable licences. In 2022 there will be 8 licences with all types of netting removed from the licence. In 2018, Corio Bay will be closed to commercial netting. The Port Phillip Bay Fishery operates under strict government-regulated management arrangements, and with a voluntary Code of Practice. 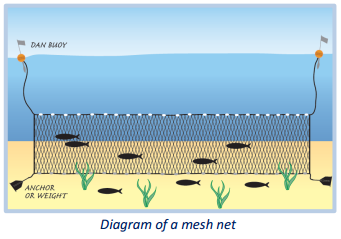 Gear type, with haul seine nets no longer than 460 metres, mesh nets no longer than 2500 metres, a purse seine net no longer than 460 metres, and longlines with no more than 200 hooks. Fishers are also permitted to use 3 metre hoop nets and 6 fish traps. The Victorian Fishery Association into Resource Management has a Voluntary Code of Practice for commercial haul seine fishing in Port Phillip Bay. Bay and Inlet fisheries are naturally variable fisheries, and are highly dependent on environmental conditions outside the system which affect the abundance of target fish species from year to year. Port Phillip Bay fisheries are ecologically sustainable, with no concerns raised by state or federal fisheries managers. Fisheries assessments by Fisheries Victoria (link) and the 2016 Status of Australian Fish Stock (SAFS) reports, show that the Port Phillip Bay fisheries are in excellent shape overall. King George whiting – A highly prized species targeted by professional and recreational fishers, the stock status for Port Phillip Bay by Fisheries Victoria is classified as ‘sustainable’ under current management. SAFS also report King George Whiting as ‘sustainable’. Snapper – Port Phillip Bay snapper are part of the western snapper stock in Victoria (west from Wilson’s Prom to south eastern South Australia). Port Phillip Bay is the main spawning and nursery habitat for the Western stock. Recreational catches of snapper are much higher than the professional fishery with the most recent 3estimate at 800 tonnes. Commercial catch rates are well above average and the stock is not of concern under current management. Fisheries Victoria and the SAFS report Port Phillip Bay snapper as ‘sustainable’. Southern calamari – The biological stock structure of calamari is not well understood and is assessed as a single Victorian stock. Commercial catch rates for calamari are good in Port Phillip Bay and the stock is not of concern under current management. Fisheries Victoria and the SAFS report Port Phillip Bay calamari as ‘sustainable’. Rock flathead – There is limited data on rock flathead in Port Phillip Bay, although the catch rates are above the long-term average. In 2012 a Fisheries Victoria assessment of rock flathead said Port Phillip Bay rock flathead are in good condition (link).